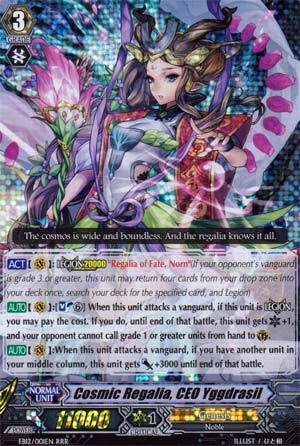 Number 7 is a card that I KNOW is going to be sticking with us for a while, CEO Yggdrasil. I reviewed her a few weeks ago, and I don't want to repeat myself too much, but know that she's good. really good. You can pretty much copy-paste my review for her then save for the score which I will revise. I would recommend 4 of this and 4 Minerva, for the build she belongs in. Splitting Grade 3s among 3 candidates is such a 2012 strategy, man. ...I would have rated this one MUCH higher than #7 myself. Please refer to my previous review, nothing has changed since then. Except you, Jamie, you're a jerk, getting a Legion rare like that.